Just like after yesterday’s Prop 8 case, Supreme Court forecasters wasted no time after the oral arguments on the Defense of Marriage Act today to start predicting how the justices will rule. Without bothering to digest what they saw and with no decision expected until June, court reporters are still close to a consensus that it doesn’t look good for the constitutionality of DOMA, which gives federal benefits only to straight couples. That was the case before the oral arguments, which typically matter very little anyway, and nothing that happened over the course of the two hours inside did much to alter those expectations. #doma jurisdiction argument continues with no clear indication of whether a majority believes #scotus has the power to decide the case. 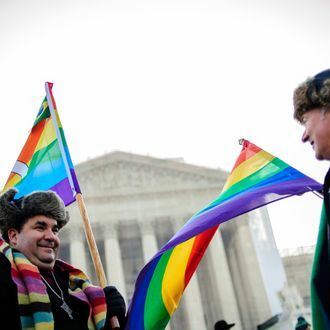 “DOMA is in trouble,” said Jeffrey Toobin on CNN. As the procedural portion of the day’s arguments wound down, it wasn’t completely clear that the court believed it was free and clear to rule on the merits of DOMA’s constitutionality. The reservations the justices expressed during Wednesday’s proceedings stood in contrast to last year’s health-care arguments, where the court sent clear signals early on that it would decide the constitutionality of the health law. Lawyer Paul Clement, representing the House, opened the main portion of the morning’s arguments that examined DOMA’s constitutionality. He faced several tough questions from the court’s liberal wing—and from moderate conservative Justice Anthony Kennedy—that asked why the federal government had the right to define marriage, given that the issue was one traditionally reserved for the states. During initial arguments today on the 1996 Defense of Marriage Act, Justice Anthony Kennedy suggested that a federal law that doesn’t recognize gay marriages that are legal in some states can create conflicts.